This is a word of warning to any other Audreys who may be reading this: if you are planning to become a world traveler, it may be in your best interest to change your name before you leave home. I have come to the conclusion that the majority of people in the world are unable to pronounce the name ‘Audrey’. The kids have the best versions– one little girl in my English class calls me “Ordinary didi” and to the little kid of the family I live with, I am “Eddy didi”. “Didi” is a Hindi word that means “older sister” and all the kids call me that. When I’m teaching English to adults, I’m just “ma’am” and other than that I’m only Audrey. Or Audey. Or Otree. Or Ahji. I don’t know if I’ve mentioned this before, but I’m living with a South Indian family. Delhi is in northern India, and Hindi is the main language here. In south India there are many different languages (Tamil, Telugu, Malayalam, etc.) The native language of this family is Tamil, which means that in the past few weeks I have become somewhat familiar with Tamil movies and TV shows. And they’re all pretty much awful. The TV shows (all soap operas) are the worst, because there is hardly any action. One of the characters will say something and then dramatic music will play, and then there will be a five second close-up of the facial expressions of each of the main characters– one may be staring off in stunned silence, another may have a tear running down his/her cheek, and yet another may be trying to still a trembling jaw and hold off tears. Tamil movies are also basically ridiculous. They’re just as long as Bollywood movies (around three hours each) and every one has long, drawn out fight scenes in which the hero is ridiculously outnumbered (twelve to one is a common ratio), but the attackers are considerate and only fight the hero one at a time. And every man has a mustache. Here’s a link to a scene from the Tamil version Singham, one of the movies I recently watched. My internet accessibility hasn’t been very regular here in the village… When I say “village,” I still mean New Delhi. Shahabad Mohammad Pur is a tiny area of New Delhi, and I would by no means call my lifestyle urban– I take bucket showers, the house I’m staying in has no central heat/air, no microwave, etc. A real village would be way more primitive though, and far away from the rest of civilization, whereas I’m only a five minute motorcycle ride from the metro station. Final thought: teaching English is probably the most satisfying thing I’ve ever done. To connect and build relationships with the students and laugh with them and see them start to become braver in asking questions and to be excited with them when the sound that comes out of their mouth is the one they were going for is just a great thing that I can’t really even describe. I believe that everyone should volunteer to teach English at some point. It doesn’t have to be in India, or even in another country– people are trying to learn English everywhere. The feeling that comes from helping someone to learn something that can alter the course of his or her life is a crazy awesome thing, and I love what I’m doing. 1) Most people have socks that you can wear with flip flops. Like one toe and then the other four are all together. 3) Technically, it’s less cold here than in America, but there’s no central heat so it feels way colder… at first I thought it was cute how bundled up everyone is, but now I’m wearing hoodies/scarves/thick socks too. 4) The shower warming thing is an accident waiting to happen. It consists of a metal coil (which kind of looks like a lightbulb) that is stuck down into a bucket of water. 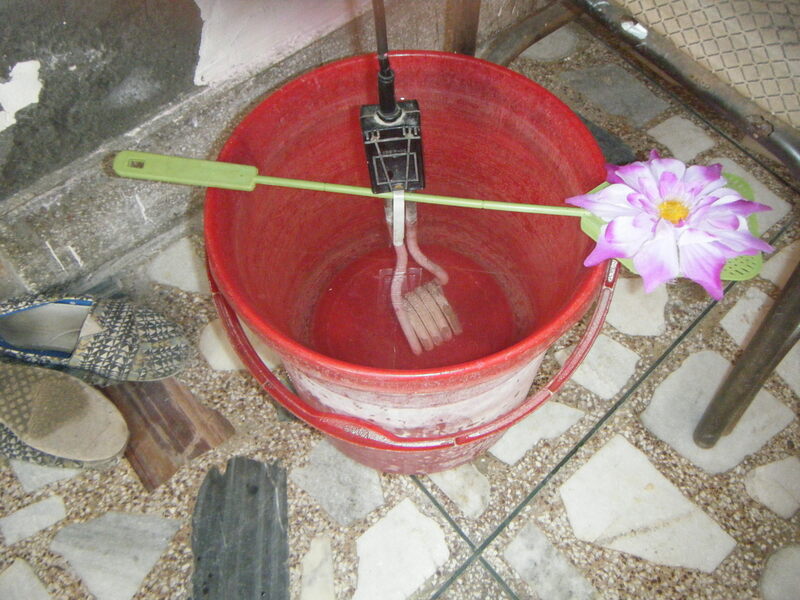 A flyswatter or stick lies across the top of the bucket and this little apparatus hooks onto it to keep the coil suspended in the water. Once it’s turned on, it sends electricity through the water until it gradually heats up and starts steaming. After about twenty minutes you have a scalding bucket of water for your bucket shower! Heating water... in style. Not really, we just lost the stick. 5) Even though I am now the master of the squatty potty, I still think American toilets are a better idea. 6) There are a lot of children in India. I somehow became an English teacher to kids on the weekdays during their winter vacation and millions of them come every day, out of nowhere! Also, every single one of them is adorable. And they all believe I can speak Hindi. When in actuality I hardly speak any at all.